I keep hearing rumors of a canned pumpkin shortage, but every time I've visited my Fresh & Easy store in the past two months, the shelves are stocked full. That hasn't stopped me from stocking up on pumpkin. Luckily, it's almost Thanksgiving so I have plenty of opportunities to use my pumpkin. 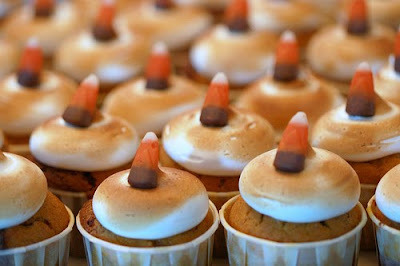 Cupcake Bake Shop recently posted a recipe for Chocolate Pumpkin Cupcakes with Toasted Meringue Frosting. I've mentioned several times how much I love pumpkin cupcakes, but I have yet to try a cupcake with pumpkin and chocolate. Each cupcake has a mixture of pumpkin batter and chocolate batter. 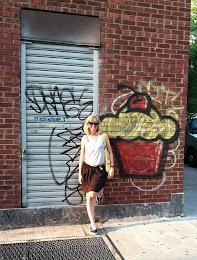 I love the idea of toasting the meringue frosting to give the cupcake a little bit of a crunch. This is definitely at the top of my list to make for Thanksgiving. Hopefully my oven will be fixed by then!